The Martin B-26 Marauder was a medium bomber from World War 2 that was used extensively by Allied forces in raids over Europe including during the June 6th 1944 D-Day invasion of Normandy, France. Over 5,000 were produced between 1941 and 1945 (operated by USA, France – Free French, UK and South Africa) and the last B-26 was retired from USAAF service in 1947. Despite having the lowest loss rate of any USAAF aircraft in the war only 3 complete airframes exist on display today (1 in France and 2 in the USA – Fantasy of Flight and the National Museum of the US Air Force), with an additional one in the Smithsonian – National Air and Space Museum (“Flak Bait“) that is currently only displayed as a nose section but they have the rest of the aircraft in storage. There are also an additional 3 under restoration in the USA. 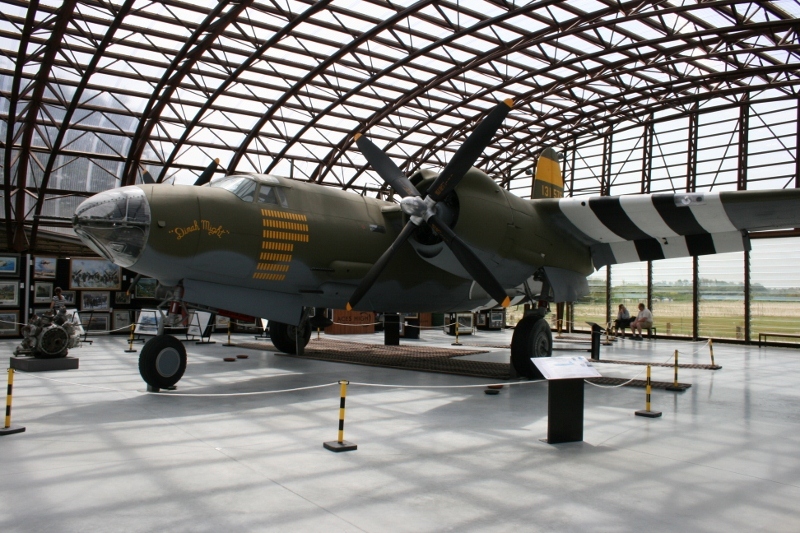 The surviving airframe in France is B-26G “Dinah Might“ that is on display at the Utah Beach Museum near Sainte-Marie-Du-Mont (one of the famous landing sites for the D-Day invasion of Normandy). This airframe was on display at the Le Bourget Air & Space Museum in Paris but was relocated in 2010 to a purpose-built display hall at Utah Beach. This particular model did not fly over Normandy but is painted up to represent the 386th Bomb Group – 9th USAAF. I paid a visit to the Utah Beach Museum on May 31st 2012 and I have to say it is one of the best in the region and the B-26 is beautifully restored. Makes me day dream about being a fighter pilot :). My father, Captain Robert T. Harris of the 386th Bomb Group, was shot down over Germany on November 18th, 1944, while piloting “Dinah Might” on her last mission. The entire crew got out safely before the aircraft exploded, and he spent the rest of the war in Stalag Luft 1, a German prison camp near Barth, Germany. My dad is alive and well, living in Tryon, North Carolina with my mother. He turned 90 years old in March of this year. He has many stories about flying the B-26, including making probably the only successful dead-stick landing in a B-26. Has he ever written down his stories? Be great to hear some of them I am sure! I hope he likes the fact that the French have paid tribute to his particular B-26 with this restoration in Normandy? Dad is very happy and proud that they chose “Dinah Might” to represent the B-26 Marauder at the Utah Beach Museum. He says the crews often were assigned to different aircraft–he flew Rat Poison, Spare Parts, Our Baby and several others, and Dinah Might on her last mission. He has no contemporary pictures of that airplane, but we have a couple of him and his crew in front of other B-26’s. He has dozens of stories about the B-26, and I have most of them written down. The Marauder had a bad reputation in the beginning as a hot and difficult airplane and was nicknamed the “Widowmaker” and the “Flying Prostitute” (“no visible means of support,” because of its short wingspan.) But Dad, like most B-26 pilots, loved flying Marauders, and flew more than 50 missions in them. Thanks for posting your excellent pictures–my father and brothers were delighted to see them. Thanks Susan, I am glad they enjoyed the photos. I’m sorry to say that my father passed away on June 19, 2013, at age 92. My brother, who has visited the Utah Beach museum, has archives on nearly all of his missions and quite a lot of information on the group, the aircraft, etc. He’s happy to share that information with anyone who’s interested. If you’d like my brother’s contact information, please PM me or contact me though my website. Thanks for posting this excellent historical information. Sorry to hear about your Father Susan. My condolences. I have always wanted to put my hands on a B-26. My dad flew 61 missions in the Mediterranean in 1943-44, with the 320th. I have his log books, ID card, and some of his memorabilia. Unfortunately he did not think that any of us would want his leather flight jacket with his painted on nose art (a pelican dropping bombs from his beak) and he left it behind when we moved in the 60’s. Some day I will touch a B26. Ah to have that jacket today Pete! Sadly there are not many B-26’s about today but what a great looking aircraft! I discover your page by making an article about the Marauder of the landing museum of Utah Beach. Being passionate about this period of history, I can say that I was touched by the comments of the children of these brave soldiers who came to deliver us from the Nazi infamy. Thank you and especially thank you to them. Thanks Nicolas. It was great to hear from them for sure!